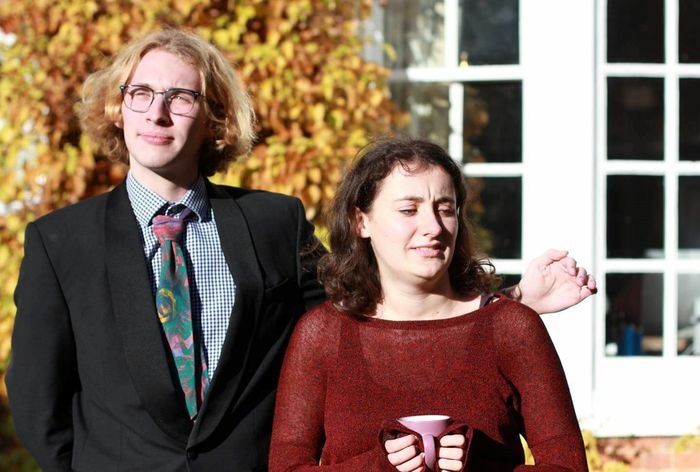 The JCR is new student writing from Seth Jordan and Adrianna Hunt, who are also the co-directors of this mockumentary/sketch comedy that aims to poke fun at the world of college politics. The conceit is that we are following an unnamed JCR committee, who are mostly an unpleasant, self-absorbed lot, as they go about their business, as if they were being featured in a documentary. "some of the characters could have been fleshed out more to make the humor seem more natural"
The videography (Joe Cook, Seth Jordan) is well done, especially the bit that opens the show. This features the amusing comments of random passers-by at Sidgwick being interviewed about their thoughts on JCRs. More generally, I also liked how the writers paired the make-believe seriousness of mockumentary with the empty superciliousness of student politics. Unfortunately, I also felt that the conceit began to stretch a little thin as the show went on. There were some pretty good one-liners, but it was also clear at some points that the plot and dialogue were straining under the weight of having to set up particular jokes that were shoe-horned into the script. While I was obviously expecting to see caricatures, rather than believable characters, given the mockumentary style of the production. Yet, I did still feel that some of the characters could have been fleshed out more to make the humor seem more natural and less forced. The exception to this rule is Edwin (Archie Williams), the posh, scheming Vice-President who gets most of the best jokes. I particularly enjoyed his Powerpoint presentation, ostensibly a plan for an ABBA-themed garden party, which quickly segues into a bewilderingly irrelevant lecture on historical battles. I felt, however, that the show would have been greatly improved if one of the other characters was given a larger role and was able to serve as a foil to Edwin; as things stood, there was no one for Williams to play off of and make full use of the energy created by his best lines. On the whole, The JCR is an enjoyable experience with some funny moments, but has room to improve in terms of becoming more consistently humorous as well as injecting some more substance into the script.